By Richard King. In the last 50 years, the way in which we take offence has undergone a radical change. Everyone is offended; hurt feelings are paraded like union banners. Offence has been democractised - and that is not good for democracy. It has opened the door to a new mood of censoriousness, self-pity and self-righteousness: a world of 'offensitivity'. This mood is poisoning public debate not because it creates division, but because it is intellectually void: suddenly, it is how we feel that counts, not what we think. Political and religious leaders seek to turn offence to their advantage, while the media makes it entertainment. Offence is given in all directions, and taken even when not intended. Ironically, unofficial censorship has reopened the door to official censorship; blowing the dust off old blasphemy laws, we are moving forward into the past. 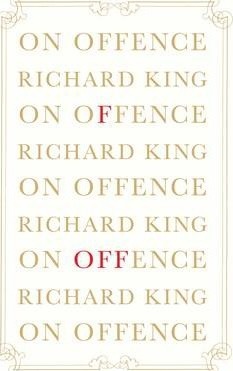 On Offence will consider how this came about by tracing the history of identity politics and political correctness. What, exactly, is offence? What is the relationship between offence and religion? How is offence used by politicians, media commentators, and social-media pundits? Is there anything we can do to halt the spread of offensitivity? Politeness is a noble quality, and decorum will always have its place. But when respect for one's fellow humans is bought at the cost of honest criticism, it's time for us to reconsider. Claim that something is offensive and it is as if the assertion itself has automatically become an argument - Hitchens ... I feel, therefore I am... Democracy I believe needs a thick skin... the West has gone from a situation in which virtue define civility to one in which consideration for one's fellow human beings does so.